I don’t have many photos of the walk up to, and back from, the summit, which is probably just as well since what photos I do have are poor in quality. I cannot remember what camera I was using at the time and I can’t see any evidence on the photos of a camera case, so it may have been one of the cheaper, simple point and shoot digital variety which was small and light enough to fit into a pocket. I remember having a few of these which always ended up dying on me for one reason or another. I do remember being reluctant to splash out on anything very expensive because the technology was changing so quickly at the time. You had no sooner bought one product than another one appeared with the next layer of bells and whistles and I refused to get sucked into the money pit spiral until it seemed as though things had settled down enough to warrant spending a bit more than usual. 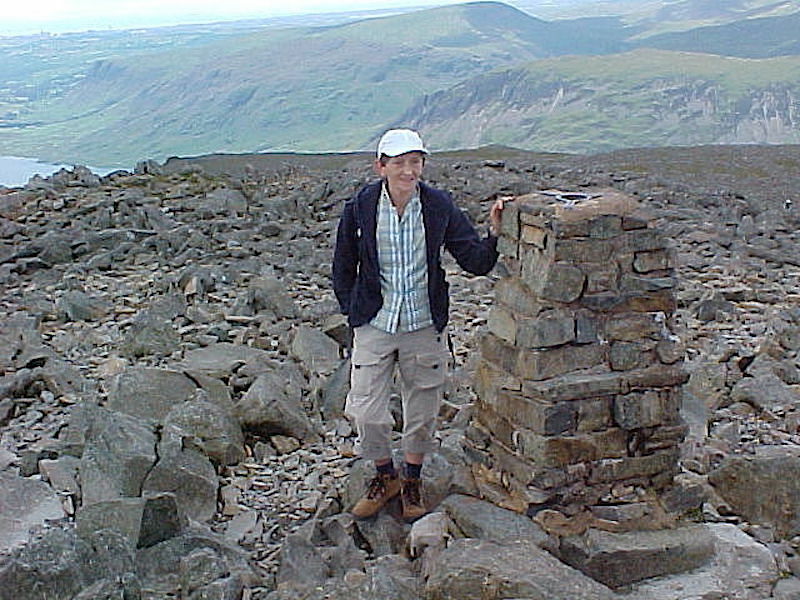 We walked up the pitched path from Brackenclose to Hollow Stones, where we had a short break and a discussion about which path to take from there up to the summit. Taking the left hand path from Hollow Stones would mean more of the same, whereas following the right hand one would add interest by having to get up the stony slopes of Mickledore with some impressive crags on either side of us, even though it involved a bit more effort. Ahead of us was a woman with two young boys and she was carrying a huge back pack which didn’t seem to slow her down very much. When we reached Mickledore she and the boys were already there, but what really surprised us was that she had unpacked and lit a gas burner, on the top of which sat a pan full of what looked like a thick meat and vegetable stew, which was already warming up nicely. 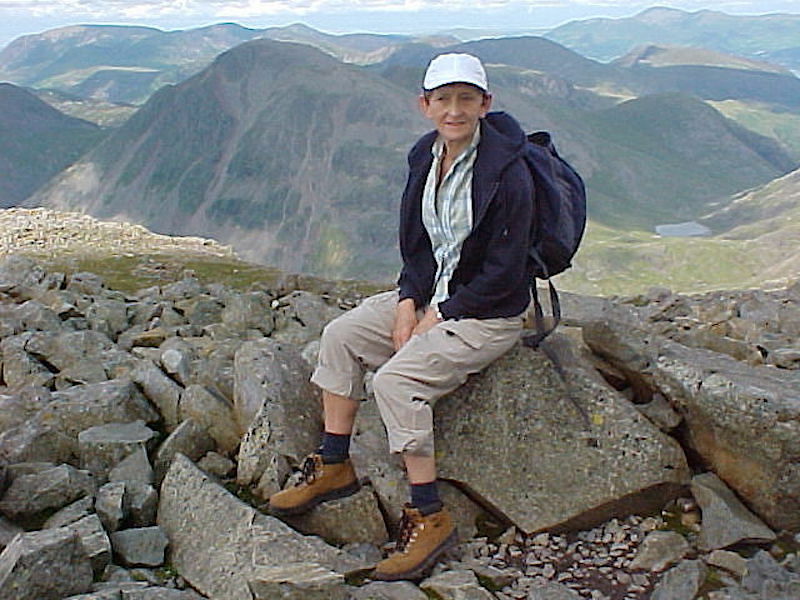 Meanwhile she was busy getting out the bowls and spoons and calling for the two boys to come back and have their lunch, so casual was she that they could have been having their lunch on some campsite or other, rather than being perched on a rock outcrop with long drops down either side. 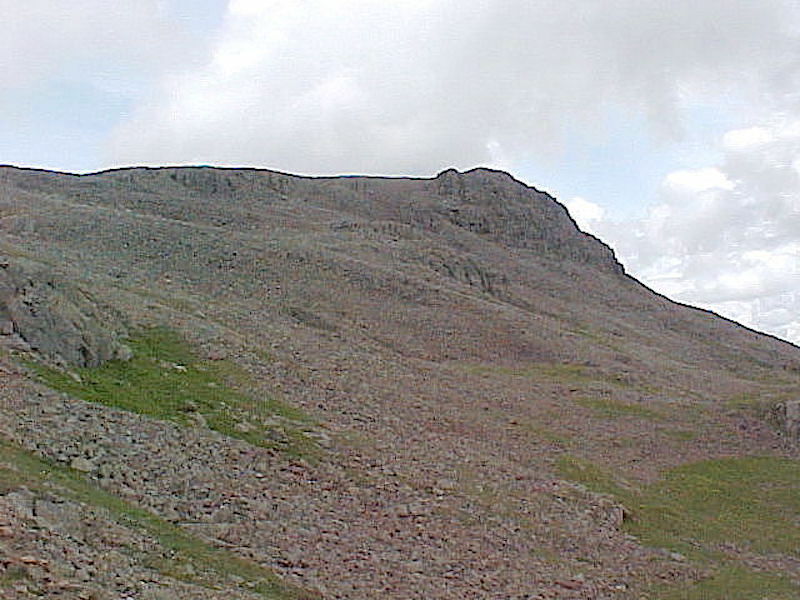 Anyway, I digress, here’s a shot of Scafell Pike summit from Mickledore, now there’s just the little matter of a half mile walk over that boulder field. AW’s opinion seemed perfectly reasonable to us so we took a break on Mickledore and, in relative comfort and absolute safety, viewed the surrounding verticals. The woman with the stew was over to the right of the shot. The skyline behind forms part of the Mosedale Horseshoe, with the sunlit slopes of Lingmell just behind me. We teetered our way across the boulder field, a nightmare walk full of potential for twisted ankles, and arrived at the trig point just below the summit area. There’s just a smidge of Wast Water showing over on the left, and my photographer has just about managed to include the top of Seatallan on the centre skyline behind me. 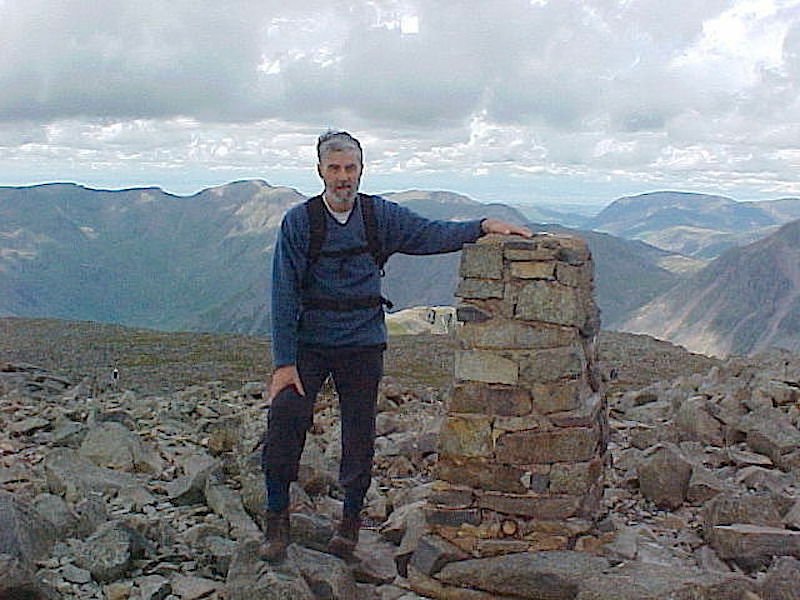 Once you’ve reached the highest rock on England’s highest summit there’s nowhere else to go but down. 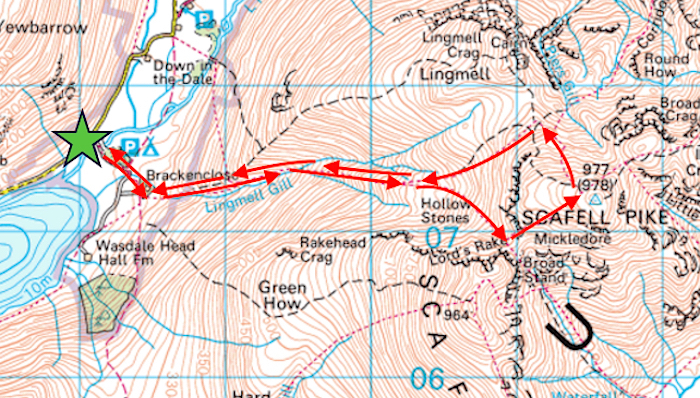 Before we do, you may be interested to know some of the distances from here to some of the fells on the skyline. 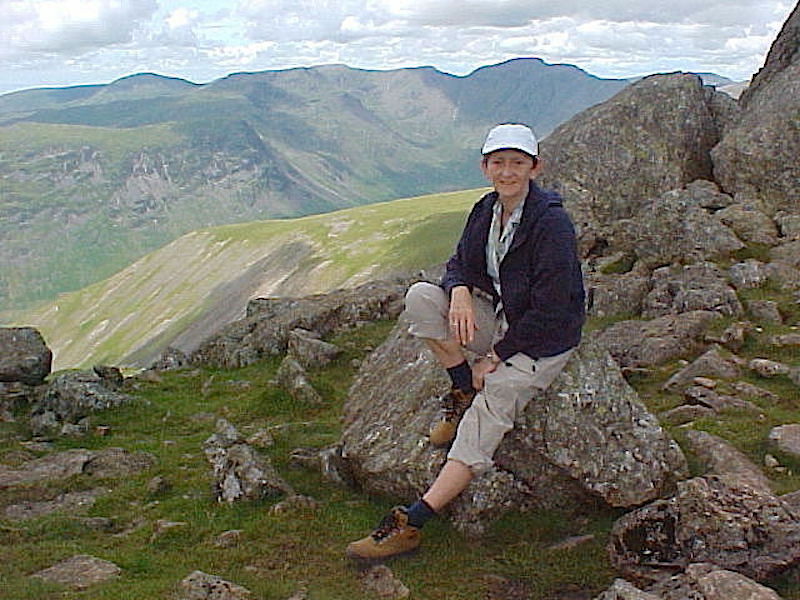 On the far left is Skiddaw, 13.75 miles away, on the centre skyline, behind the intrepid summiteer, is Blencathra, 14.5 miles away, and on the far right is Clough Head, 12 miles away. Good thing the cloud wasn’t down or I wouldn’t have been able to include that. I will own up to not doing the measuring , AW had already done it and put the all the details in Book 4, which saved me having to get the ruler out. The views were worth all the effort but I don’t look too thrilled. This is not my favourite fell, not because of the terrain or the height, its to do with the attitudes you encounter up here. 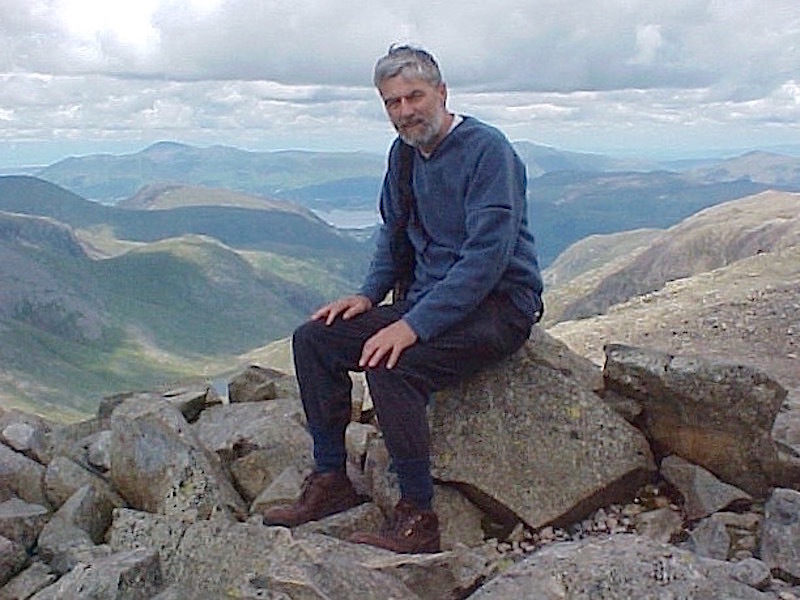 OK, its the highest summit and reaching it is an achievement but it hardly merits the swaggering self-importance you witness when you get up here. Its not an impenetrable peak located somewhere in the back of beyond, and there are paths leading up from all directions, so well trodden and so full of walkers that you barely need to consult a map to reach the top. It is simply a steep walk up a high hill. Perhaps all that goes some way to explaining why its so many years since we came here. Will we return? Perhaps. Previous Previous post: A long time ago in a galaxy far, far away …..